January 17, 2019 Toros del Este placed OF Steven Moya on the reserve list. January 8, 2019 OF Steven Moya assigned to Toros del Este. November 6, 2017 RF Steven Moya elected free agency. June 27, 2017 RF Steven Moya assigned to Erie SeaWolves from Toledo Mud Hens. May 27, 2017 Toledo Mud Hens activated RF Steven Moya from the 7-day disabled list. May 19, 2017 Toledo Mud Hens placed RF Steven Moya on the 7-day disabled list. Left oblique strain. March 31, 2017 Detroit Tigers sent RF Steven Moya outright to Toledo Mud Hens. September 6, 2016 Detroit Tigers recalled RF Steven Moya from Toledo Mud Hens. August 18, 2016 Detroit Tigers optioned RF Steven Moya to Toledo Mud Hens. August 16, 2016 Detroit Tigers recalled Steven Moya from Toledo Mud Hens. July 17, 2016 Detroit Tigers optioned LF Steven Moya to Toledo Mud Hens. June 17, 2016 Detroit Tigers recalled Steven Moya from Toledo Mud Hens. May 28, 2016 Detroit Tigers optioned LF Steven Moya to Toledo Mud Hens. May 12, 2016 Detroit Tigers recalled Steven Moya from Toledo Mud Hens. March 26, 2016 Detroit Tigers optioned RF Steven Moya to Toledo Mud Hens. October 16, 2015 OF Steven Moya assigned to Toros del Este. September 8, 2015 Detroit Tigers recalled Steven Moya from Toledo Mud Hens. April 25, 2015 RF Steven Moya assigned to Toledo Mud Hens from Lakeland Flying Tigers. April 16, 2015 RF Steven Moya assigned to Lakeland Flying Tigers from Toledo Mud Hens. April 4, 2015 Toledo Mud Hens placed RF Steven Moya on the 7-day disabled list. March 22, 2015 Detroit Tigers optioned RF Steven Moya to Toledo Mud Hens. 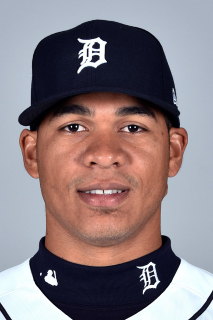 October 13, 2014 Steven Moya roster status changed by Detroit Tigers. October 2, 2014 Detroit Tigers reassigned RF Steven Moya to the minor leagues. September 1, 2014 Detroit Tigers recalled RF Steven Moya from Erie SeaWolves. March 14, 2014 Detroit Tigers optioned RF Steven Moya to Erie SeaWolves. November 20, 2013 Detroit Tigers selected the contract of Steven Moya from Lakeland Flying Tigers. October 17, 2013 OF Steven Moya assigned to Toros del Este. May 22, 2013 Steven Moya roster status changed by Lakeland Flying Tigers. April 10, 2013 Lakeland Flying Tigers placed RF Steven Moya on the 7-day disabled list. March 30, 2013 RF Steven Moya assigned to Lakeland Flying Tigers from West Michigan Whitecaps. March 2, 2013 OF Steven Moya assigned to Detroit Tigers. September 14, 2012 Steven Moya roster status changed by West Michigan Whitecaps. June 27, 2012 West Michigan Whitecaps placed OF Steven Moya on the 7-day disabled list. Sprained right elbow. May 11, 2012 West Michigan Whitecaps activated OF Steven Moya from the 7-day disabled list. March 16, 2012 OF Steven Moya assigned to Detroit Tigers. November 5, 2011 OF Steven Moya assigned to Toros del Este. May 11, 2011 OF Steven Moya assigned to West Michigan Whitecaps from GCL Tigers. May 1, 2010 Steven Moya assigned to GCL Tigers from Detroit Tigers. April 1, 2010 LF Steven Moya assigned to Detroit Tigers. May 29, 2009 DSL Tigers signed LF Steven Moya.